Land of kilts, bagpipes, castles and whisky. Where accents are confusing and spoken sentences are met with a questionable shrug or a pardon me? The sun is a distant memory and grey skies and rain have taken its place. Whatever the time of year front yards are decorated with colourful foliage and the hills are blanketed in different shades of green – a unique beauty. These characteristics are well known throughout the world but what many don’t know is that it’s a white water wonderland and all paddlers should add it to their bucket list. 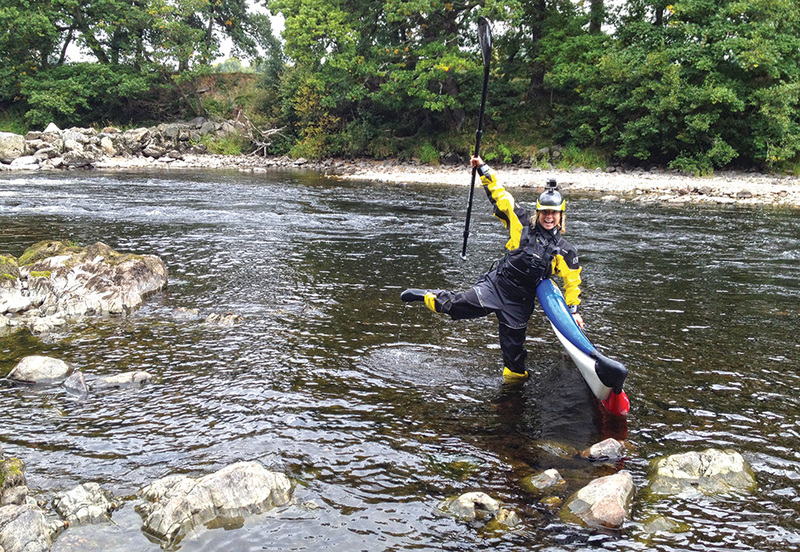 I had been to Scotland once before and realised I stumbled upon a paddling mecca. Everywhere I went some of the best paddling I had ever seen was hiding. Some of it way too extreme mixed with runs that looked challenging but were within my capabilities. When I arrived in Aberdeen it was early September, a month thought to be one of the wettest of the year. To my surprise the sun was shining and the weather was warm. I took the opportunity to paddle off Aberdeen Beach. The North Sea, with its rugged coastline, fierce winds, and high seas is not the most welcoming but I enjoyed calm waters and blue skies. What I came here to do, though, was paddle white water. The River Dee, a class I-II and recognised as one of the most scenic rivers in Scotland, was first on my list. 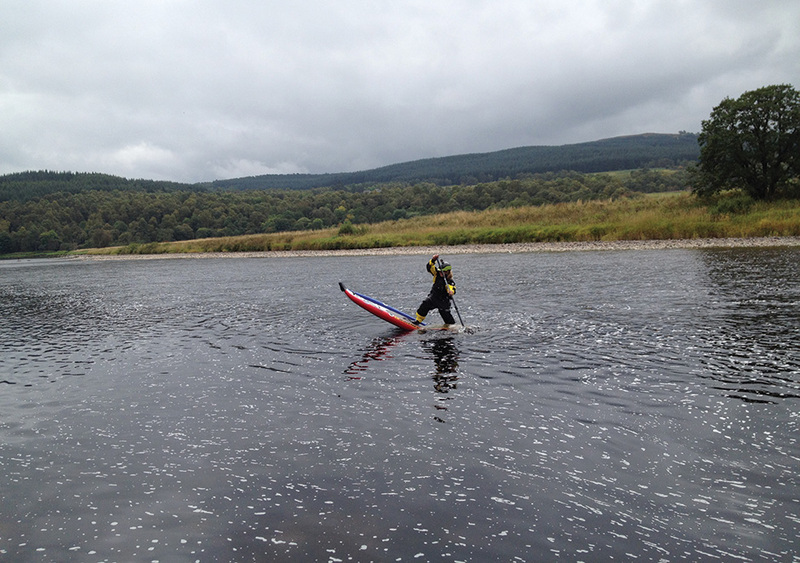 Thirty miles upstream I began gearing up, excited for my first SUP in Scotland. Before my board was on the water I had an audience of 10 people leaning over the bridge with inquisitive looks, trying to figure out what this wee girlie was about to do with her surfboard. I attempted to explain but was met with confusion and a bit of concern. It was apparent they thought I was crazy. As I paddled away I received a heartfelt farewell; hands were waving and words of encouragement flowed as I began my adventure. The paddle started mellow, allowing me to fully take in my surroundings. Farmlands, quaint cottages, green mossy rocks and bushy towering pine trees lined the banks. I happened upon a few men wading up to their knees, fishing poles in hand, patiently waiting for a salmon to float by. They were surprised to see me but were all smiles and laughter. At points it was so shallow I actually had to get off my board and walk – even the fisherman said this is unusual for this time of year. 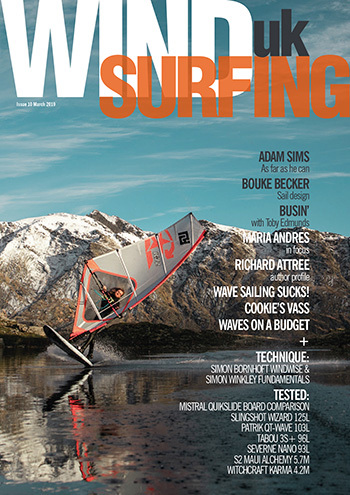 With lower water levels come more technical runs. The rapids were challenging, channels were narrow and I had to be quick. Another 500 CFS and that run would be an ideal stretch for those wanting to get into white water SUP. While waiting for rain (it’s usually the other way round! – Ed) we found some more touristy things to do. I was lucky to catch a cultural Scottish gem – the Highland Games. Bagpipes were played, kilts worn by ninety percent of the men – it was a fantastic display of Scottish culture. Before long it was time to head north to Aviemore where I took part in the Cairngorm Adventure Triathlon. Sunny days were filled with mountain biking, coastal drives and beer! The River Tummel is a river based on dam release and there was a chance of catching it at a nice level. The Tummel is located two hours south west of Aberdeen flowing near the charming little town of Aberfeldy. 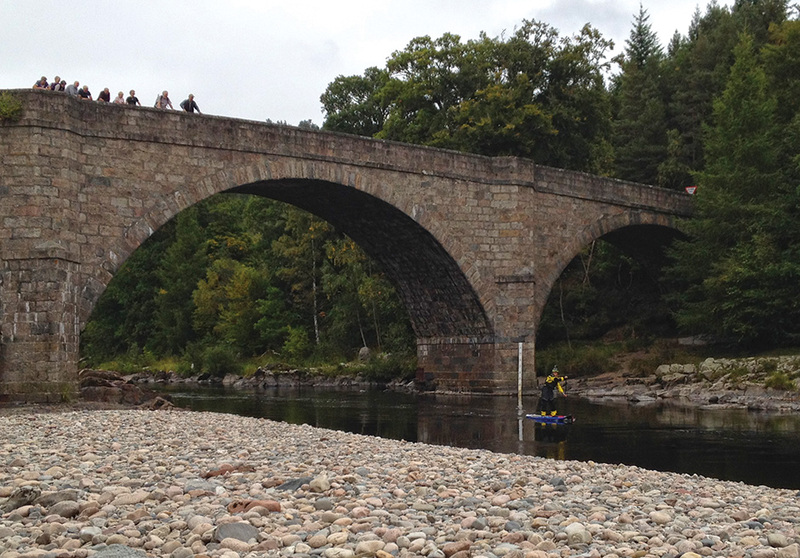 The Lower Tummel is the section most frequented by white water enthusiasts, popular for commercial raft trips, river bugging, kayaking and most recently stand up paddling. Graded as a class III ending in a class IV-V drop, this one required a lot more planning and a bit of guidance from the local outfitter Splash Adventures who gladly obliged to take me out and show me the lines. Head guide Kevin was a spirited man with a passion for white water as pronounced as my own. The layout allowed you to park at the take out and walk just a quarter mile up the road and down a foot path to the top of the run – a short but action packed three mile section. River bugging is the most popular and unique activity that Splash provides. Described as a small floatation device that closely resembles a ‘lazy boy’ wearing webbed gloves you navigate downstream using your hands as paddles. This seemed like the perfect way to do a test run and get familiar with the rapids. Kevin explained where we needed to be for the upcoming rapid. He’d paddle the line and be ready to catch me if I overshot the eddy and went floating off. Often, I found myself paying more attention to the beauty around me than the water. The river is surrounded by dense greenery making it feel remote. Air was cool and moist, the rocks that blanketed the river bed and banks were polished smooth from hundreds of years of flowing water. 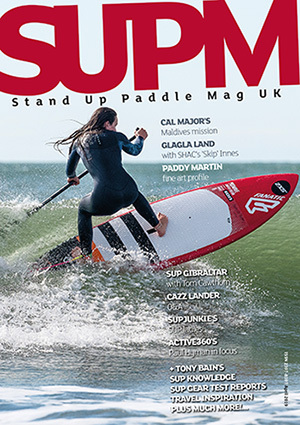 It was a river unlike any I had ever paddled before – I was stunned and itching to get on my board. Having launched I paddled into a channel, then a small drop into a bubbling pool with an eddy not big enough to fit my board. Staggering to my feet and getting low I cleared the first section. Before I could celebrate I was setting up for my next obstacle – a narrow rowdy channel just to the left. Unfortunately, the first rapid pushes you far right into jagged rocks and a solid beating so I had to be agile. Laying back on my tail for a quick pivot turn and a couple powerful strokes I made it and cleared my first rapid – confidence was high. 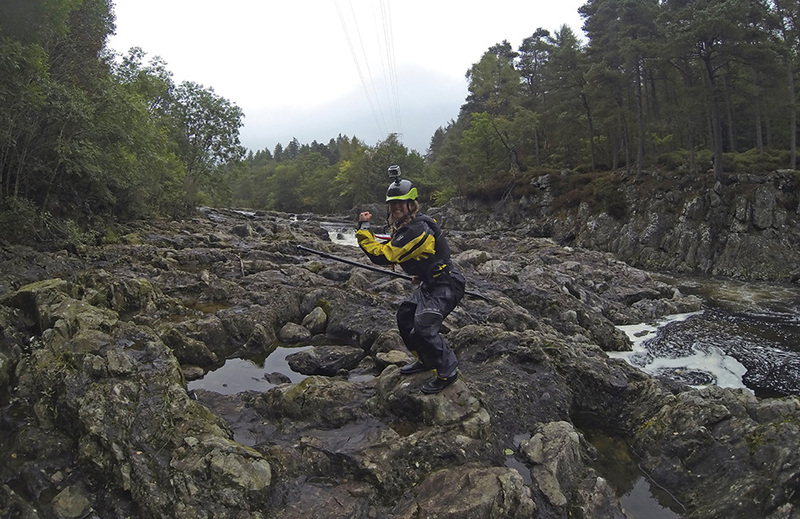 I was now ready to hit the big one – The Falls of Tummel. This grand finale, an exciting descent, amounting to 15 feet altogether. There was power here – enough to melt away all the confidence I had acquired from the last rapid. At this level the drops were very bony. If I chose to do the whole set there was no room for error. Falling meant plummeting down, which could result in getting caught up on a shark tooth rock. 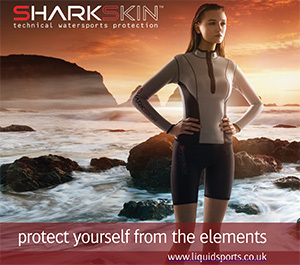 This would easily cut through my drysuit and flesh. Deciding the risk outweighed reward I opted to skip the first drop and do the second. Kevin put emphasis on getting as close to that shark tooth rock without actually hitting it. This was the safest line but all I could hear was the roaring falls. My heart was beating out of my chest and I was scared. It was now or never! I pushed off, aimed for the rock but I was too close. My board clipped and sent me flying. But I came up laughing, was unharmed and ready to take it on again. The next time I made it through the slot but gravity, as well as the impact, worked against me and I was swimming once again. 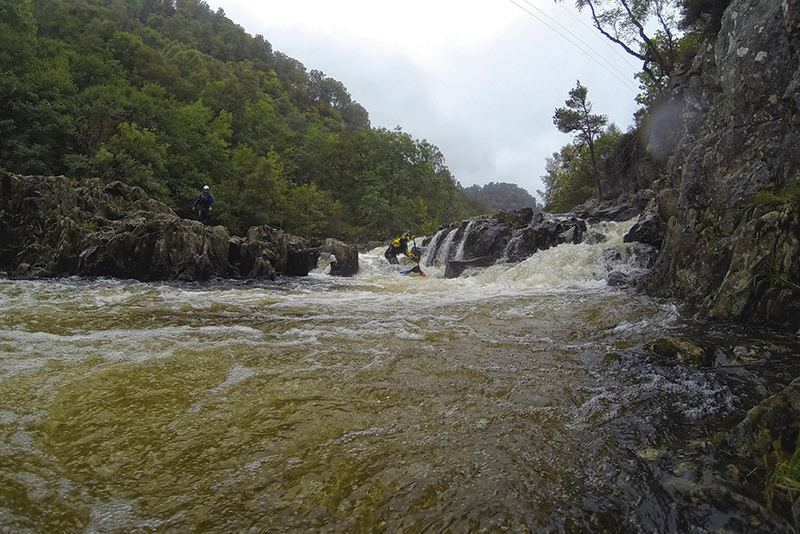 I was relentless, lapping the falls over and over again but in the end the Falls of Tummel won and sent me packing. It was the most challenging, technical, and beautiful river I’ve ever had the privilege to SUP. These rivers will mould you into an extremely strong and well-rounded paddler and I only wish I could place this spot in my own backyard in Colorado. It was encouraging to see locals bringing the sport to life and I can only hope I added to their enthusiasm and opened them up to the never ending possibilities of stand up paddle boarding.